With the 50th anniversary festivities in 2013 and a new Doctor to celebrate in 2014, the last two years have provided plenty to talk about when it came to Doctor Who. But what about Torchwood, the little sibling that never gets any respect? It’s been in limbo since the not-great Miracle Day, but we’d still love to see Captain Jack Harkness back in action. Well, we will be getting that wish granted…minus the “see” part. 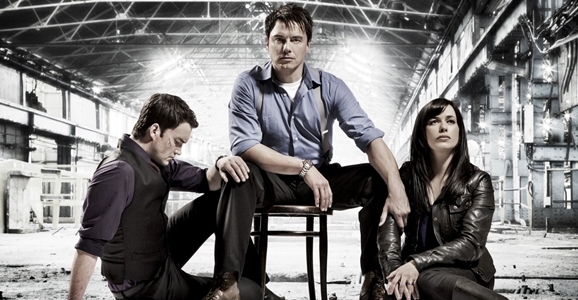 While promoting The CW’s Arrow at the 2015 TV critics winter press conference in Pasadena this week, actor John Barrowman (Captain Jack) revealed that, while there’s no news about another season/miniseries of Torchwood, the characters will be returning in three or four planned BBC radio plays. Barrowman says the plays will be “character-based,” but hints that at least one of them will involve what the Post Gazette describes as “the whole Torchwood team.” Of course, it’s anybody’s guess what that means at this stage, since Torchwood has been notoriously brutal to the team’s membership over the years. We can assume the return of Captain Jack and Gwen Cooper (Eve Myles), but what about Mekhi Phifer’s Rex Matheson, who was certainly left in an interesting state at the end of Miracle Day? Time will tell. Two other Torchwood vets who will be involved are creator/writer Russell T Davies and executive producer Julie Gardner. The actor didn’t specify what Davies’ exact role would be, but Barrowman himself may write one of the radio plays with his sister and frequent writing partner, Carole Barrowman. The siblings have previously collaborated on John’s memoir, a Torchwood comic strip called “Captain Jack and the Selkie,” and the 2012 novel Hollow Earth. It’s not a question of me not wanting to do it, it’s a question of the BBC wanting to do it or others wanting to do Torchwood. I know the fans are out there so I think they’d be silly not to.